An outbreak of shooting has taken place in Gaza, hours after rival Palestinian groups Hamas and Fatah reached a deal to end factional fighting. Witnesses said a gunman had opened fire on a convoy carrying Palestinian Prime Minister Ismail Haniya. But a Hamas spokesman said an exchange of fire took place in an area that Mr Haniya was visiting, but the convoy was not directly targeted. In the deal, the groups agreed to refrain from acts that raised tensions. At a meeting in Gaza brokered by Egyptian mediators, the groups also committed themselves to dialogue as the means of resolving their differences. Hamas - which leads the government - and Fatah are locked in a power struggle and the political differences between them remain deep. About 20 people have been killed in Palestinian factional fighting in recent weeks. Witnesses said relatives of an activist killed earlier this month in factional fighting, who had been a member of Palestinian leader Mahmoud Abbas's Fatah movement, had opened fire on Mr Haniya's convoy. They also said one vehicle had been set on fire. But Hamas spokesman Ghazi Hamad said an "exchange of fire" between members of the family and Hamas security forces "coincided" with the prime minister's departure from the Nusseirat refugee camp. No-one was injured, he said. The two factions have agreed to end "all practices and acts that contravene the law and Palestinian traditions, such as kidnapping, shooting, show of force and different physical attacks," Fatah spokesman Tawfeeq Abou Khosa told al-Jazeera television. They have agreed to end news conferences in which one side attacks the other and to set up an office staffed by members of both groups in order to resolve disputes before they become violent. BBC Gaza correspondent Alan Johnston says that at the height of the factional violence, the centre of Gaza City became a battlefield. 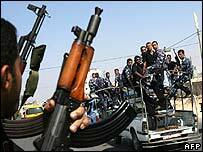 A powerful Hamas-controlled militia clashed with units of the security forces that are seen as being loyal to Fatah. Similar agreements to restore calm have been made in the past but have not lasted. The Hamas government regards elements in Fatah as being in collusion with the West in an effort to oust it from power, says our correspondent. With such profound tensions unresolved, he says, the danger remains that they will spill over into bloodshed on the streets. In comments on Thursday evening, Mr Abbas hinted he might be considering dismissing the current Hamas cabinet. "We are going to make the decisions about forming a cabinet that abides by Palestinian and Arab and international legality to lift the siege from our people and mitigate its suffering," he said. But in comments on Friday, Mr Haniya said forming a new government would not solve the current "so-called crisis". A government proposed by Mr Abbas would need the backing of the Palestinian parliament and so would need Hamas support, he said.